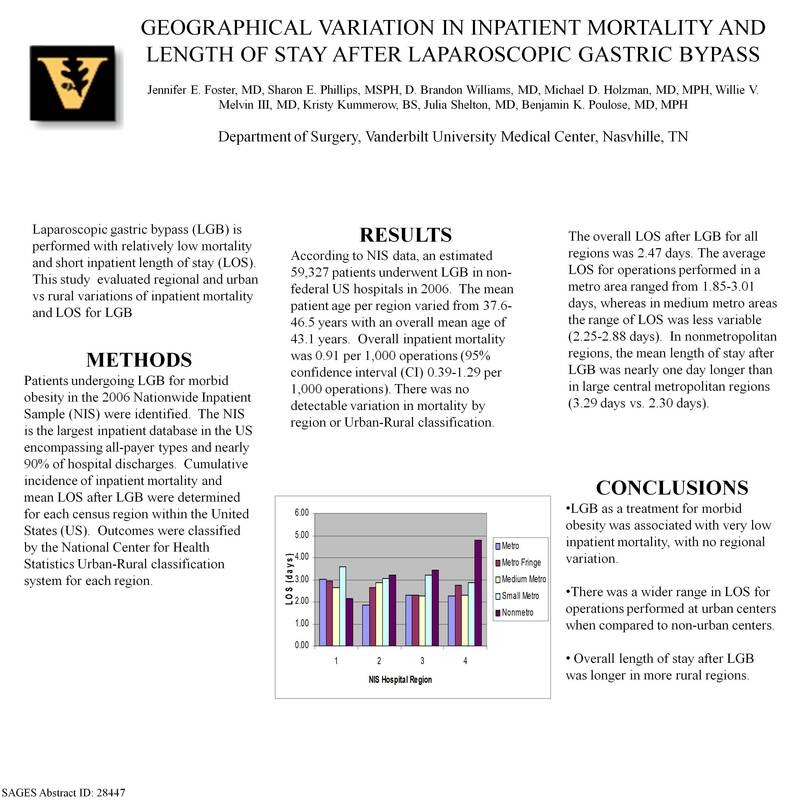 INTRODUCTION – Laparoscopic gastric bypass (LGB) is performed with relatively low mortality and short inpatient length of stay (LOS). This study evaluated regional and urban vs rural variations of inpatient mortality and LOS for LGB. METHODS AND PROCEDURES – Patients undergoing LGB for morbid obesity in the 2006 Nationwide Inpatient Sample (NIS) were identified. Cumulative incidence of inpatient mortality and mean LOS were determined for each census region within the United States (US). Outcomes were classified by the National Center for Health Statistics Urban-Rural classification system for each region. RESULTS – According to NIS data, an estimated 59,327 patients underwent LGB in non-federal US hospitals in 2006. The mean patient age per region varied from 37.6-46.5 years with an overall mean age of 43.1 years. Overall inpatient mortality was 0.91 per 1,000 operations (95% confidence interval (CI) 0.39-1.29 per 1,000 operations). There was no detectable variation in mortality by region or Urban-Rural classification. The LOS for operations performed in an urban center ranged from 1.85-3.01 days, whereas in suburban areas the LOS was 2.25-2.94 days. In non-urban regions, the mean length of stay after LGB was nearly one day longer than in large central metropolitan regions (3.29 days vs. 2.30 days). CONCLUSIONS – LGB as a treatment for morbid obesity was associated with very low inpatient mortality, withno regional variation. There was a widerrange in LOS for operations performed at urban centers when compared to non-urban centers. Overall length of stay after LGB was longer in more rural regions.